With so many things to focus on when doing a kitchen remodel, the space underfoot is often one of the last to capture your attention. But think of the flooring as the base upon which you build your kitchen remodeling endeavors and give flooring its due upfront. In actual practice, the flooring is often of the last elements of the remodel to be installed. This is most often done to save wear and tear on the product while the rest of the remodel is underway. But what are some of the options for flooring? How easy are these to care for? What is their benefits and cost? Let’s consider a few. Vinyl Flooring: This is often the lowest priced flooring option. It can usually be installed in a single day. Vinyl flooring comes as sheet vinyl or vinyl tiles and is available in a wide array of colors and textures. Its actually created in four layers which include: a strong urethane top layer, a clear vinyl layer, a design layer, and last a back layer which is often made of felt or fiberglass. Linoleum: Sometimes confused with vinyl, linoleum is actually made from natural materials such as solidified linseed oil, resin, cork dust, wood flour, and limestone with pigments added. Its usually applied on a burlap or canvas backing. It is antibacterial and tends to be comfortable to stand and walk on. It’s also very easy to clean and quite durable. Like vinyl, it comes in sheets or tiles. It starts a little higher in cost than the more economical vinyl. Wood Laminate: This flooring is durable and low maintenance. Since it comes pre-finished, installation can proceed quickly. Modern wood laminate is fairly moisture resistant. However, remember that even the small seams seen in wood laminate flooring can sometimes allow water to infiltrate and undermine your floor from beneath. Tile: With all the colors and patterns to choose from, it can easily become the base of your kitchen remodel. The time and labor required to install tile often means that even when choosing lower priced tile, it does not tend to be one of the cheaper options for flooring. Tile is easy to clean but the grout may need attention as it ages. Tile can also be cold underfoot. For those interested in the environment, consider some of the newer earth-friendly, sustainable flooring choices such as bamboo or cork. If you’re considering a kitchen remodel and would like to discuss flooring, cabinets, and all the other options available to you with a remodel expert, Just fill out the online form to the right or call us at 1-714-693-1111. 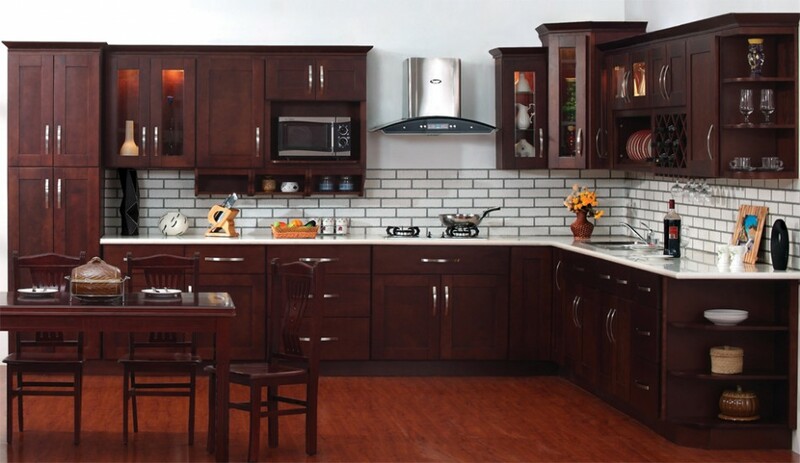 Cabinet Wholesalers offers a FREE no-obligation 30-minute estimate. With their help your kitchen remodel can be tailored to meet all your family’s needs.